Easy-to-make chicken with a little variation. 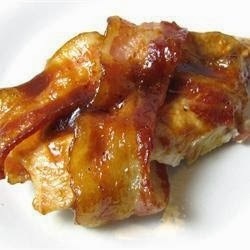 Great on the grill but just as good baked in the oven when you can't grill out,, Wrap chicken breasts in bacon, bake or grill, and top with barbeque sauce for a simple, delicious weeknight meal. If you prefer, substitute sweet-hot chile sauce for the BBQ sauce. Cook bacon in a skillet over medium heat until the edges begin to crisp, about 5 minutes; drain bacon on paper towels. Wrap each chicken breast with 2 slices of bacon in an x-shaped pattern and place into the prepared baking sheet with bacon ends underneath. Bake in the preheated oven for 30 minutes; spread barbeque sauce over chicken breasts and bake until the juices run clear, the chicken is no longer pink inside, and an instant-read meat thermometer inserted into the thickest part of a breast reads at least 160 degrees F (70 degrees C), 10 to 15 more minutes.